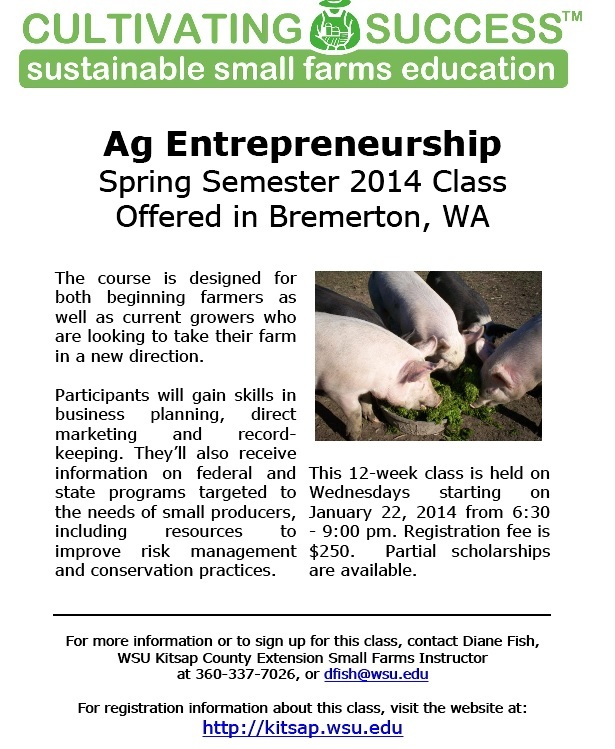 BREMERTON – WSU Kitsap County Extension will be offering its popular Ag Entrepreneurship Course on starting and sustaining a profitable small farm or agricultural enterprise beginning January 22nd. Community members are invited to sign up for this intensive, hands-on learning opportunity. The course features a full line-up of local guest speakers: bankers, accountants, attorneys, and successful farm owners. Participants will gain skills in business planning, direct marketing and record-keeping. They’ll also receive information on federal and state programs targeted to the needs of small producers, including resources to improve risk management and conservation practices. The Ag Entrepreneurship course costs $250, including materials. The cost to community members has been reduced due to a USDA grant and partial scholarships. Continuing Education Units are available. The course will be held Wednesday evenings from 6:30 to 9:00 pm at the Norm Dicks Government Center located at 345-6th Street in Bremerton. To register for the Ag Entrepreneurship Course or for more information contact Diane Fish at 360-337-7026, dfish@wsu.edu. Registration information can also be viewed on the web at: http://county.wsu.edu/kitsap/. Per forty thousand square feet of lot area for parcels one acre or smaller or for parcels five acres or smaller located within two hundred feet of a lake or year round streamL provided, that when no dwelling unit or occupied structure exists within three hundred feet of the lot on which the animals are maintained, the above specifications may be exceeded by a factor of two. Does this mean you can have one large livestock or three small livestock or five ratites or six small animals or twelve poultry, but not all of the animals per forty thousand square feet. So if I have one horse I can’t have the other animals if I have one acre. If I have five acres I can have five horses as long as I have forty thousand square feet per horse if there is a lake or stream within two hundred feet. If there is no lake or yearly stream than I can have twice as many animals per forty thousand feet. What if there is a single family home within three hundred feet of the lot which the animals are maintained that existed first? Can you please explain this as I have gotten several different explanatons. First 40,000 ft2 is about one acre. So to make it less mind boggling think “One livestock per acre.” (or equivalent thereof) And, any barn or housing for the animals must be 300 feet from the neighbor’s house. So if the neighbor has a house 200 feet from your property line, the BARN needs to be another 100 feet away from the property line (most buildings can be only 35 feet from a property line). And all this may change because they are rewriting the Kitsap County Code for agriculture this fall.